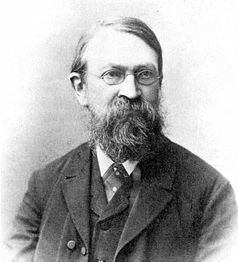 Ernst Mach (February 18, 1838 – February 19, 1916) was an Austrian-Czech physicist and philosopher. He is the namesake for the "Mach number" (aka Mach speed), and the optical illusion known as Mach bands. Today Mach is probably best known for his positivistic account of science and for his subsequent influence on philosophers and the entire field of philosophy, especially analytic philosophy and the philosophy of science. The members of the Vienna Circle considered themselves to be his followers—in fact they at first called themselves the Verein Ernst Mach (Ernst Mach Society). Their admiration of Mach suggests that Mach was positivist, empiricist, and anitmetaphysical in his attitude. (Alexander, 115) Mach also had a strong influence on American physicist and philosopher Percy W. Bridgeman (1882-1963), and, according to Bridgeman, on Albert Einstein because of Mach's operationalist approach. Einstein called Mach the "forerunner of [the] Theory of relativity." Mach had an enormous range of scientific interests. According to Peter Alexander, the American philosopher William James met Mach in 1882 and reported that Mach "appeared to have read and thought about everything" (Alexander, 115). Ernst Mach was born in Chrlice (now part of Brno), Czech Republic. He was educated at home until the age of 14, then went briefly to gymnasium before entering the University of Vienna at 17. There he studied mathematics, physics and philosophy, and received a doctorate in physics in 1860. His early work was focused on the Doppler effect in optics and acoustics. In 1864 he took a job as professor of mathematics in Graz; in 1866 he was also appointed as a professor of physics. During that period Mach became interested also in the physiology of sensory perception. In 1867 Mach took the chair of a professor of experimental physics at Charles University, Prague. Mach returned to the University of Vienna as professor of inductive philosophy in 1895, but he suffered a stroke two years later and retired from active research in 1901, when he was appointed to the Austrian parliament. He continued to lecture and publish in retirement. Mach died on February 19, 1916 in Haar, Germany. Bust of Mach in the Rathauspark (City Hall Park), Vienna, Austria. Most of Mach's studies in the field of experimental physics were devoted to interference, diffraction, polarization and refraction of light in different media under external influences. These studies were soon followed by his important explorations in the field of supersonic velocity. Mach's paper on this subject was published in 1877 and correctly describes the sound effects observed during the supersonic motion of a projectile. Mach deduced and experimentally confirmed the existence of a shock wave which has the form of a cone with the projectile at the apex. The ratio of the speed of projectile to the speed of sound vp/vs is now called the Mach number. It plays a crucial role in aerodynamics and hydrodynamics. He also contributed to cosmology the hypothesis known as Mach's principle. In the area of sensory perception, Mach is best known for an optical illusion called the Mach band. Mach developed a philosophy of science which was influential in the nineteenth and twentieth centuries. He held that scientific laws are summaries of experimental events, constructed for the purpose of human comprehension of complex data. He rejected the physicists' demand for demonstration or proof, calling it "misplaced rigor." In his view there cannot be any a priori knowledge in mechanics; instead, the basis of all scientific knowledge is sense experience. 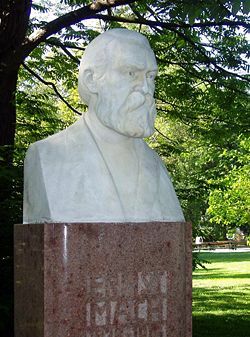 Mach admitted that he got much from the philosopher Berkeley, as well as Hume, Kant, and Richard Avenarius, and from the scientists Helmholtz, Kirchhoff, and Ludwig Boltzmann. Mach thought that to describe things we analyze them into their separately sensible qualities, and that these elements are known to us through sensation. Moreover, he held that through these simple sensations we can gain certainty, and thus scientific knowledge can be built up on a foundation of certainty through sensation. This, in turn, led Mach to the view that it could be possible to develop a unity of the sciences, a point of view and program that much commended him to the members of the Vienna Circle and the Logical Positivists. For Mach, theories are provisional; they are based on analogies that are temporary substitutes for direct sensations. Theories are valuable only as they lead us to descriptions of observed phenomena, and as they enable us to make scientific predictions. Also, in Mach's view a mathematical demonstration of a physical or scientific point cannot be any more convincing than a conclusion based on observation. Some quotations from Mach's writings will illustrate his philosophy. These selections are taken from his essay "The economical nature of physical inquiry," excerpted by Kockelmans (citation below). The goal which it [physical science] has set itself is the simplest and most economical abstract expression of facts. In accordance with this philosophy, Mach opposed Boltzmann and others who proposed an atomic theory of physics. Since atoms are too small to observe directly, and no atomic model at the time was consistent, the atomic hypothesis seemed to Mach to be unwarranted, and perhaps not sufficiently "economical." Mach's positivism was also influential on many Russian Marxists, such as Alexander Bogdanov. In 1908, Lenin wrote a philosophical work Materialism and Empirio-Criticism in which he criticized the views of "Russian Machists." Carus, Paul. 1906. "Professor Mach's Philosophy." The Monist, Vol. 16, 331. Carus, Paul. 1911. "Professor Mach and his Work." The Monist, Vol. 21, 19. Kleinpeter, H. 1906. "On the Monism of Professor Mach." The Monist, Vol. 16, 161. Mach, Ernst. 1883. Die Mechanik in ihrer Entwicklung historisch-kritisch dargestellt. Prague. Trans. by T.J. McCormack, 1893, as The Science of Mechanics. Chicago. Mises, Richard von. 1938. Ernst Mach und die empirische Wissenschaftsauffassung. The Hague. Reinhold, F. 1908. Mach's Erkenntnistheorie. Leipzig. This page was last modified on 16 August 2017, at 15:17.